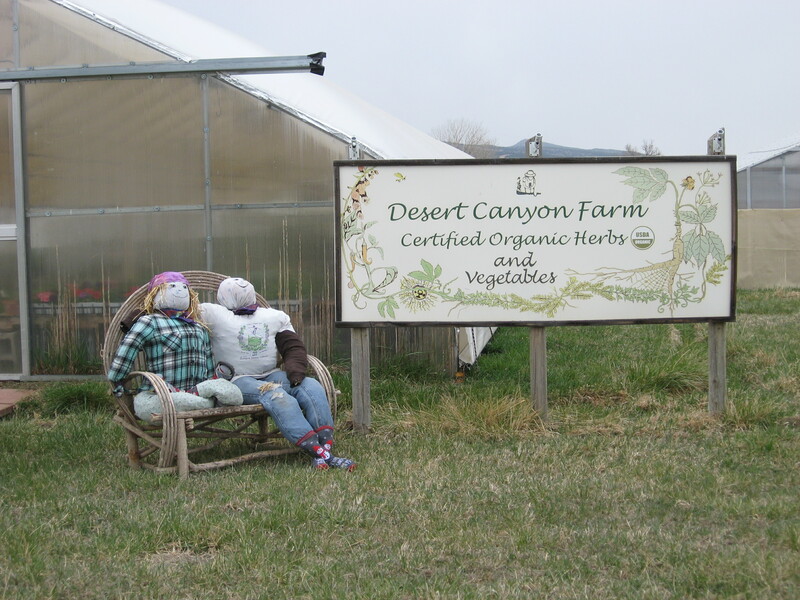 « March 30, 2018 Desert Canyon Farm Article in the Daily Record Newspaper! April 6, 2018 One Week Before We Start Our Open Farm Days! We have had another crazy busy week with wholesale business and preparing for our Open Farm Days and Farm Stand Plant Sale. We will be opening in one week on Saturday, April 14th and we have a boat-load of things to accomplish between now and then in order to be ready for our farm visitors. 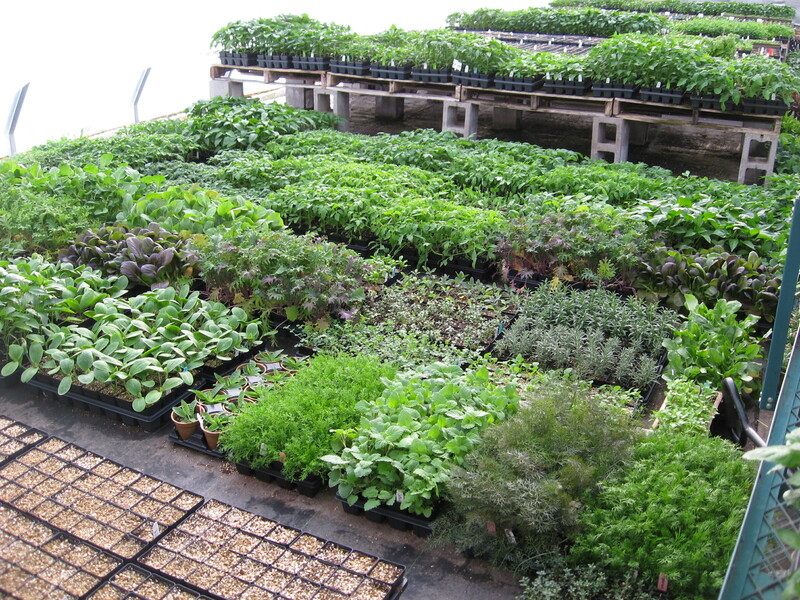 This was the open floor area around our work table in the Plant Barn greenhouse last Sunday. 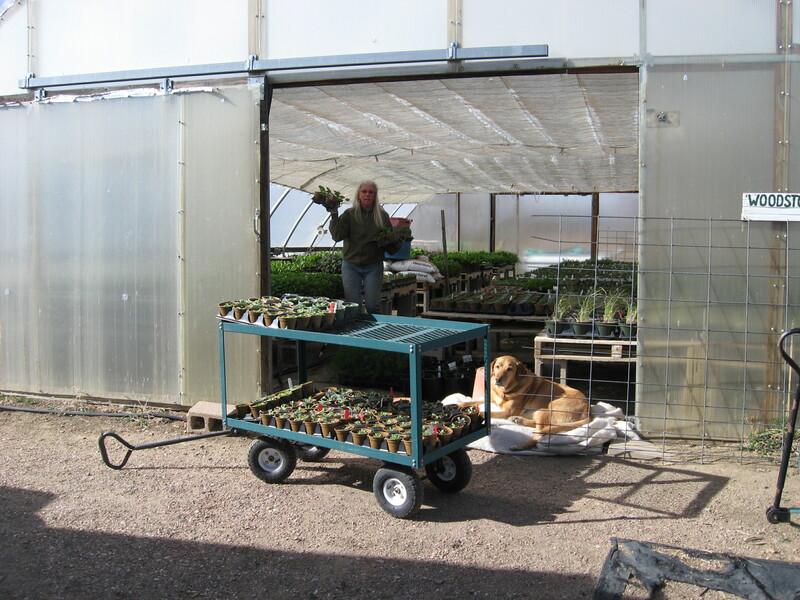 It was filled with flats of plants to process for wholesale orders that Chris delivered this week. 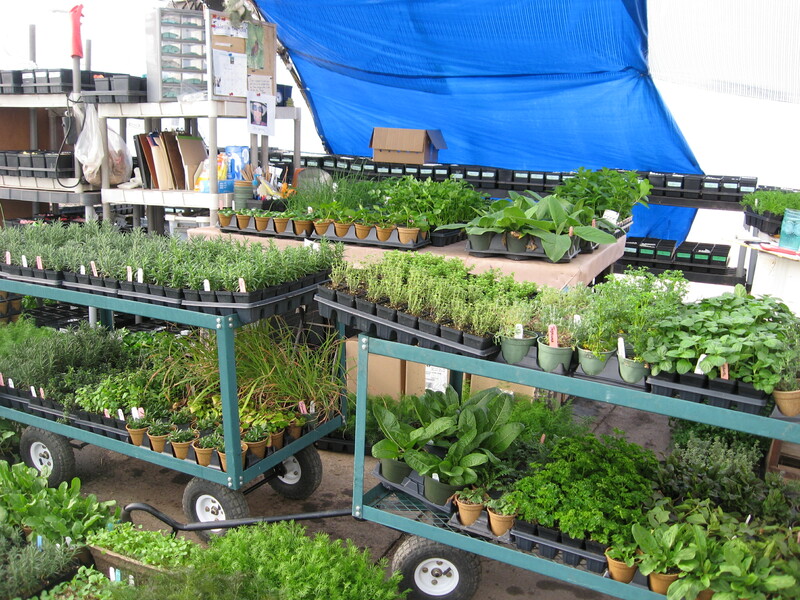 It wasn’t just the floor that was filled up…nearly every cart we own was filled with flats of plants for orders. We are in deep gratitude for these orders! That said, what a chaotic place the work space was as Lizz tried to get all the orders ready for delivery. While Lizz worked on orders, Beki and Susan were transplanting like crazy women, and Farm Stand Liz and Stephanie were busy at work in the Farm Stand store putting labels into pots of plants, staking the morning glories, runner beans and hops so that they have something to climb up as they are growing. Meanwhile, I spent nearly every moment I could moving plants from one place to the other trying to get things in the right places and to make more room for newly transplanted plants to have a warm bench to live on. We are so far out of room it’s scary! I have plants lined out outdoors everywhere because the greenhouses are full to bursting. The night-time temperatures haven’t been very helpful either. Every day the night temps have been predicted to be in the 30’s, but every night except once this week, the low temps have been in the low to mid 20’s! That’s testing the limits of some of our plants and keeping me from getting everything I need to put into place in the outdoor nursery area of the Farm Stand store. Tonight was supposed to be raining and 33 degrees, but it’s snowing and in the mid 20’s already and it’s only 8pm. So, life feels pretty challenging right now. We want everything to look nice, tidy and well-placed when we open on April 14th. It feels like the to-do lists are way longer than is even possible to accomplish, and we all have these lists with our selective tasks to do. However, we are all still smiling. I have a big stock of chai tea on hand, which is my preference to coffee, and plenty of chocolate, which is always necessary at these extra busy times. We are working as hard and fast this week to get everything done for Open Farm Days and to service our wholesale customers. Chris has put the field work on hold temporarily, as he has his own very long list of things to get done before Open Farm Days. He is also driving several days a week now making deliveries to our wholesale customers in Colorado and New Mexico. Shrek is bummed because there is not nearly the usual amount of time for doggie walks as he thinks are required. But… this is how farming is, and in this type of farming, this is the time of the year when we stretch to our absolute limits. Plus, we like what we do for our livelihood, we just wish it was a tiny bit more sane in the spring than it is. And, since this is our livelihood, we have to make this happen or we will be up a creek with no paddle as the saying goes. Now I’m done whining. Thanks for listening with patience and a smile. I appreciate that and sometimes it just feels better to get said and then return to getting things done. In our preparation for Open Farm Days, the farm visitor ambassadors have arrived this week. This couple is hanging out near the Farm Store entrance to direct anyone they see to go inside to look at all our lovely plants. 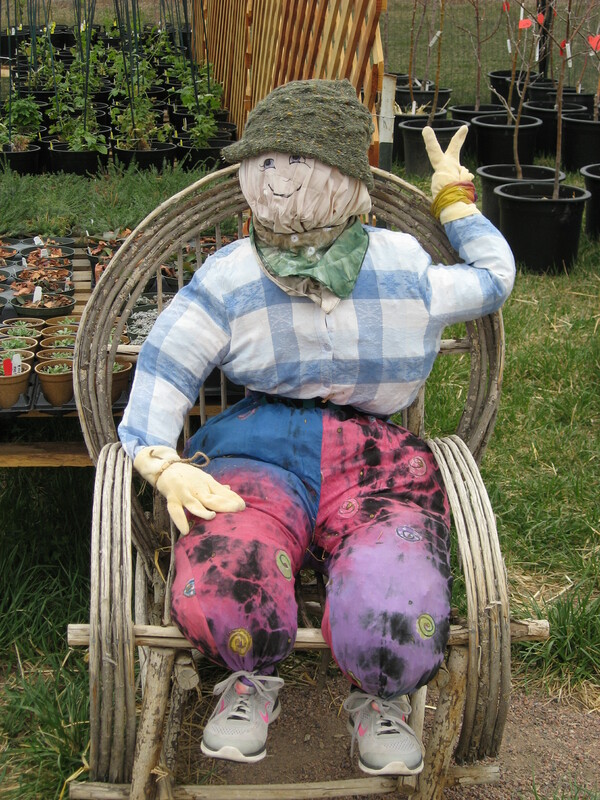 This fellow is all about peace and happiness and will surely have you smiling when you come across him in the Farm Stand nursery area. This gal likes to sit a spell and have a chat. If you find her when you visit, be sure to tell her hello. 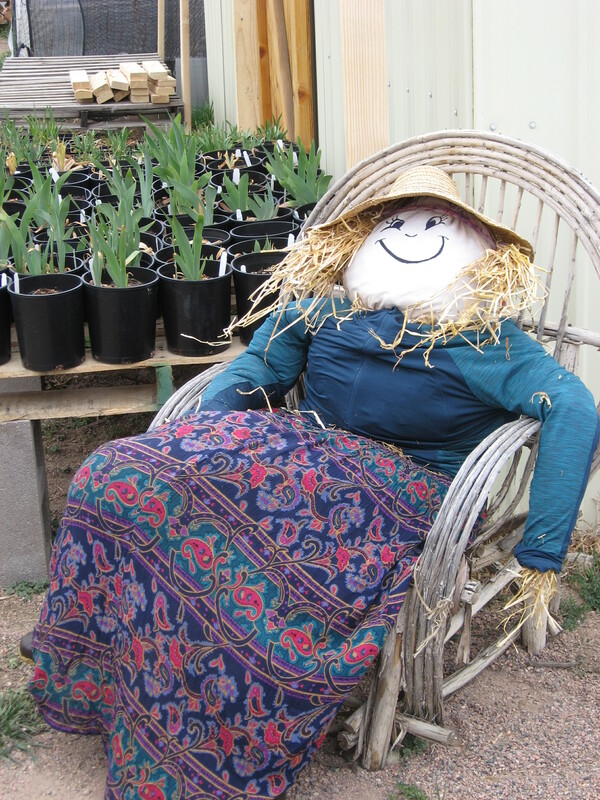 The only problem I have with our farm visitor ambassadors is that they haven’t learned how to help us move plants around yet. Every time I see them, they are just sitting around looking happy and cheerful. I guess that counts, because they are making us grin when we pass them by as we push cart-loads of plants to their spots in the Farm Stand store. 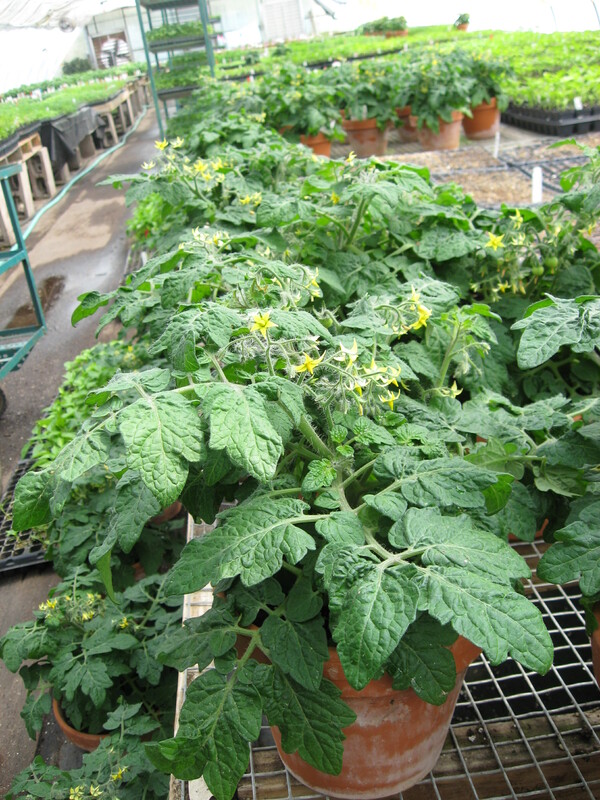 The Red Robin 8″ tomatoes are always very popular and we have a nice crop of them ready. 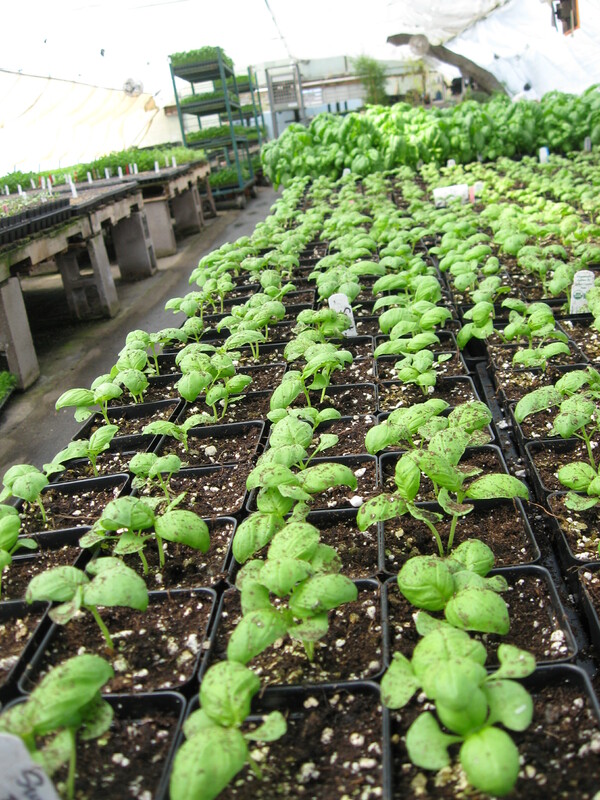 Our basil crop includes MANY different varieties of basil. These basils should be the perfect size on opening day. 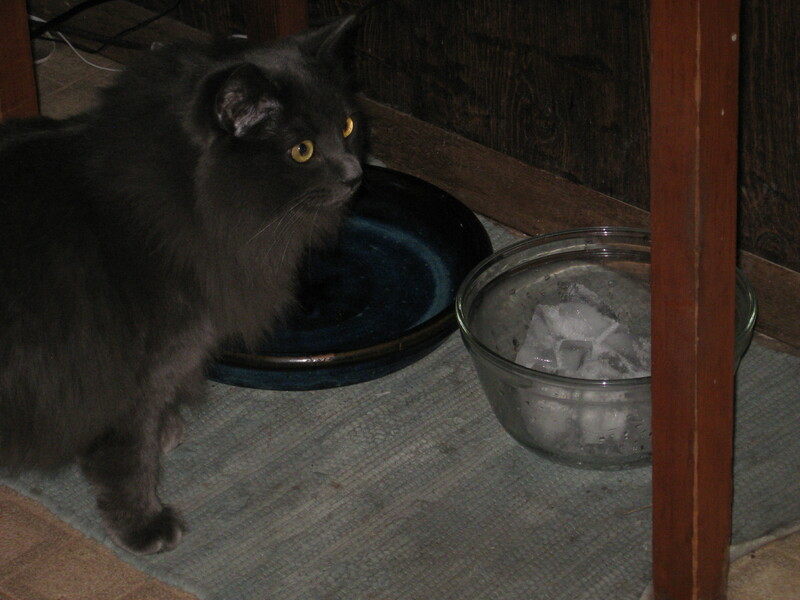 Pal has been chasing around a paper ball all evening and now he has batted it into the water bowl. He seems a little bit puzzled about how to get it out again. I’ll close for now and lend him a hand.